Vienna - UEFA has distanced itself from FIFA executive committee Theo Zwanziger of Germany, who unsuccessfully filed an ethics violations complaint against the man who will replace him in May. In an unusual move of publicly criticizing one of its top officials, UEFA secretary general Gianni Infantino said Monday the governing body of European soccer "rejects fully the actions of Zwanziger. It's not understandable. There is no ground to do so." Zwanziger asked for FIFA's ethics committee to investigate German football federation president Wolfgang Niersbach for irregularities regarding his pay and pension, but FIFA cleared Niersbach of any wrongdoing 10 days ago. "We are clearly rejecting his action," Infantino said, adding the UEFA executive committee "was really sad and upset by this situation." According to Infantino, Zwanziger hasn't showed up at any UEFA meeting during the past two years, and the German also won't attend the UEFA Congress on Tuesday. "It's all a bit embarrassing for him and sad for German football," Infantino said. Niersbach has led the German federation since Zwanziger was ousted in 2012. Zwanziger's four-year term on the FIFA executive committee ends in May. 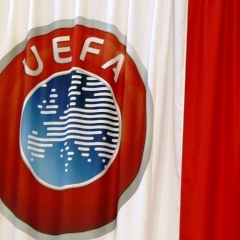 Niersbach is unopposed for election to the seat by UEFA member federations on Tuesday.